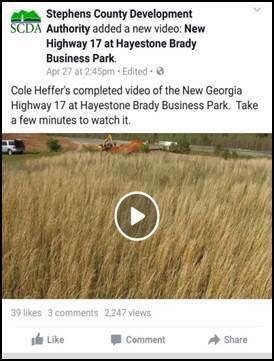 Stephens County High School Student and Toccoa-Stephens County Chamber of Commerce intern, Cole Heffer, recently created a brief video of the construction of the new GA Highway 17 at Hayestone Brady Business Park. Cole is responsible for several promotional videos of Toccoa-Stephens County floating around on social media. His use of drone footage is quite remarkable. If you have not already seen the video go to our Facebook page and click on the share icon to help us promote it. You can access the video by going directly to our Facebook page at https://www.facebook.com/StephensCountyDevelopmentAuthority or you can go to our website www.scda.biz and click on the Facebook icon in the upper right hand corner.